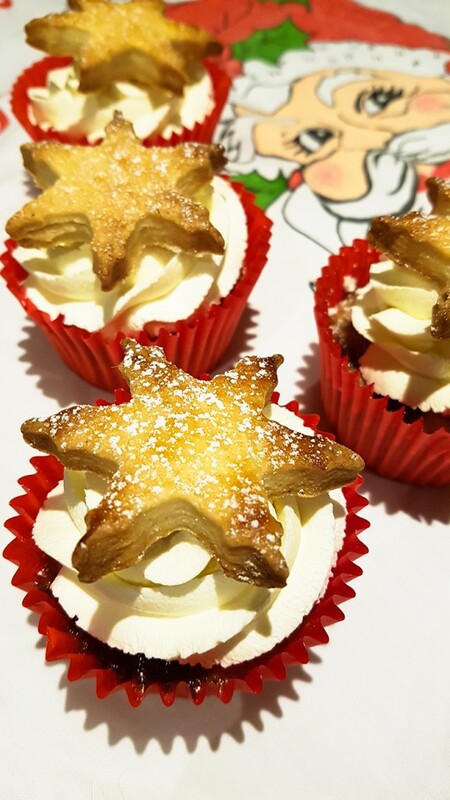 Delicious spiced cupcakes with mincemeat, frosted with fresh cream and brandy and topped with a sweet shortcrust pastry star. Christmas is the perfect excuse to get in the kitchen and bake some overly indulgent treats. 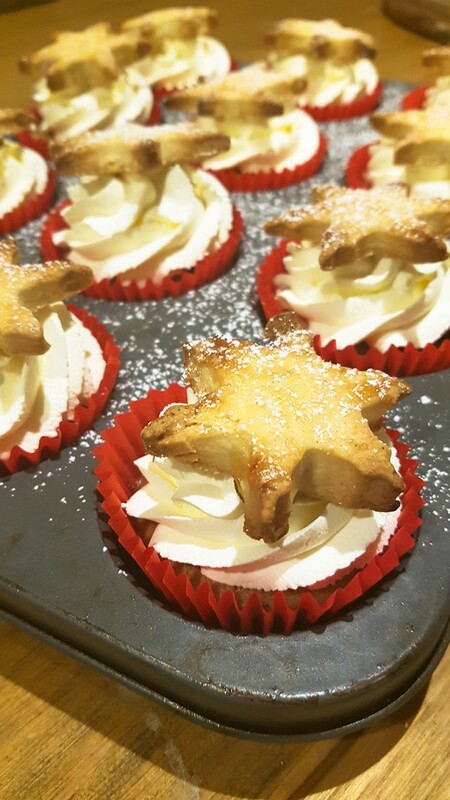 I love mince pies….last year I made a sugar free version (which were delicious) but this year I decided to make mince pies in cupcake form! And to be honest, I think I’ll be making another batch this weekend. They went down really well with everyone that tried them – even people (like my husband) that don’t like mince pies. Recipe adapted from Good To Know. Pour the cream into a bowl and whisk on medium-high speed until it just starts to thicken. Slow the speed down to medium and gradually pour in the sugar. Continue to whisk until soft peaks form. Add the brandy and continue to whisk by hand until the cream is smooth, and stiff peaks form (the cream will stand up straight when the whisk is raised). I then topped the cupcakes with a shortcrust pastry star. Obviously you could make these from scratch, but I was short on time so bought a packet mix. I mixed it with water as per the instructions, cut out stars and brushed them with egg and a sprinkle of sugar. 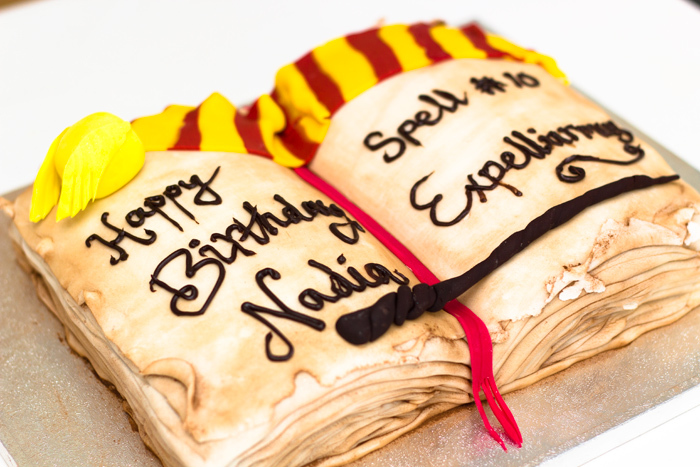 These were baked for around 10 mins (but this will depend on the size and thickness so just keep an eye on them). Once completely cooled I popped them on top of the cupcake and sprinkled them with icing sugar. 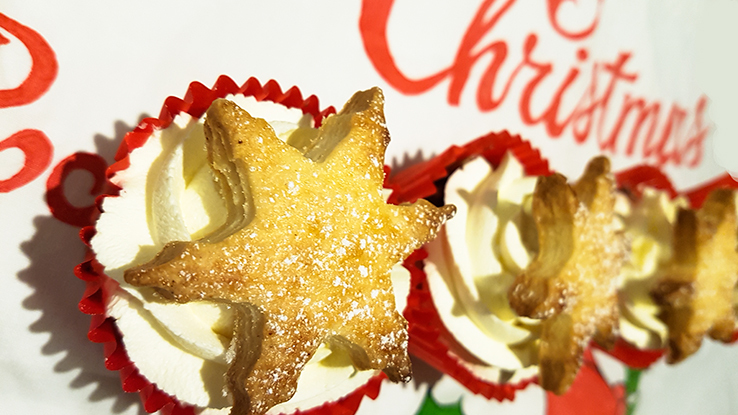 And voila…..mince pie cupcakes that taste delicious and according to some, better than the real thing! Now I’m back to the kitchen to bake more treats as this year I’m giving lots of baked treats away.